Charles Edward Louis John Casimir Silvester Severino Maria Stuart (born in the late afternoon of December 31, 1720 – January 31, 1788), was the exiled claimant to the thrones of England, Scotland, and Ireland, and was commonly known as "Bonnie Prince Charlie". Charles was the son of James Francis Edward Stuart who was in turn the son of King James VII of Scotland (James II of England and Ireland), who had been deposed in 1688. 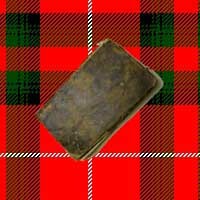 The Jacobite movement tried to restore the family to the throne. Charles' mother was James' Polish-born wife, Maria Clementina Sobieska (1702–1735). After his father's death Charles was recognized as "King Charles III" by his supporters; his opponents referred to him as "The Young Pretender" or "The Young Chevalier". The Pope refused to recognize him as king despite the best efforts of his brother, Cardinal Henry Benedict Stuart (see the Cardinal York's Memorial presented to Pope Clement XIII in late January 1766 in Appendix V of Origins of the 'Forty-Five after the funeral of his father James Frederic Edward Stuart on January 6, 1766). "Ascanius; or, the Young Adventurer" describes in great details his cause took from his first arrival with seven companions on the little isle of Eriskay, between Barra and South Uist, on July 23, 1745 to his final escape to France from Loch nan Uamh on September 19th 1746 (O.S.) after being aided by Flora MacDonald who disguised him as Betty Burke (Bettie Burk - Robert Forbes, M.A. ), an Irish spinning maid so he could escape to the Isle of Skye. 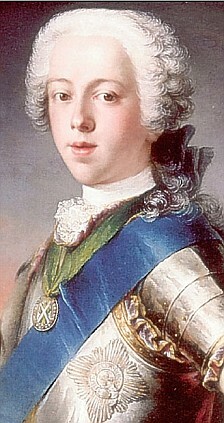 Bonnie Prince Charlie's greatest moment was his triumphal entry into Edinburgh, the Scottish capital, where he was described by Andrew Henderson, The Edinburgh History of the late Rebellion, 4th ed., page 14, as "He [the Prince] was a slender young Man, about five feet ten inches high, of a ruddy complexion, high-nosed, large rolling brown Eyes, long visage: his chin was pointed and Mouth small, in Proportion to his Features: his Hair was red, but at that Time he wore a pale Peruke: he was in Highland Dress, with a blue sash wrought with Gold coming over his Shoulder, red velvet Breeches, a green velvet Bonnet with a gold Lace round it, and a white Cockade which was the Cross of St. Andrew. He likewise had a silver-hilted broad Sword, was booted, and had a Pair of Pistols before him. His Speech was shy, but very intelligible; his Dialect was more upon the English than the Scottish Accent, seem’d to me pretty like that of the Irish, some of whom I had known". Absolute proof that he had red hair comes from this pencil and red chalk sketch by Giles Hussey in the later 1740s. In David, Lord Elcho's A Short Account of the Affairs of Scotland in the years 1744, 1745, and 1746 (with maps [larger download]) page 257. "When the Army Came near town it was mett by vast Multidudes of people, who by their repeated Shouts & huzzas express’d a great deal of joy to See the Prince. When they Came into the Suburbs the Croud was prodigious and all wishing the Prince prosperity; in Short, nobody doubted but that he would be joined by 10,000 men at Edinburgh if he Could Arm them. The Army took the road to Dediston, Lord Strathallan marching first at the head of the horse, The Prince next on horseback with the Duke of Perth on his right and Lord Elcho on his left, then Lord George Murray on foot at the head of the Colum of Infantry. From Dediston the Army enter’d the Kings park at a breach made in the wall. Lord George halted sometime in the Park, but afterwards march’d the foot to Dediston, and the Prince Continued on horseback always followed by the Croud, who were happy if they could touch his boots or his horse furniture. In the Steepest part of the park Going down to the Abey he was oblidged to Alight and walk, but the Mob out of Curiosity, and some out of fondness to touch him or kiss his hand, were like to throw him down, so, as soon as he was down the hill, he mounted his horse and road through St Anes yards into Holyroodhouse Amidst the Cries of 60000 people, who fill’d the Air with their Acclamations of joy. He dismounted in the inner court and went up Stairs into the Gallery, and from thence into the Duke of Hamiltons Apartment, which he Occupied all the time he was at Edinbourgh. The Croud Continued all that night in the outward Court of the Abbey and huzza’d Every time the Prince Appeared at the Window." There is an excellent animation on the BBC web site showing his travels here. You can also see the path on a Google map here.